Need an HEVC converter? Before we start, let’s first understand what is HEVC. High Efficiency Video Coding, also known as HEVC or H.265, is the latest video compression standard succeeding the popular Advanced Video Coding (also known as AVC or H.264). It builds off a lot of the techniques used in AVC/h.264 to make video compression even more efficient. The idea of HEVC or H.265 is to offer the same level of picture quality as AVC, but with better compression, so there’s less data to deal with. This is particularly important for 4K/Ultra HD broadcasts, 4K Blu-rays, and 8K UHD, which takes up a huge amount of space with AVC. Generally, HEVC makes 4K/8K video much easier to stream, download, or rip to your hard drive. Why Need a HEVC Video Converter? Despite all the technological advancement, HEVC seems to be a step ahead and keeps growing in popularity. And while you might not believe it, HEVC is still not supported by some PCs, media players, mobile phones, TVs, and so on. If you want to play HEVC/h.265 videos on any devices without any hassle, you have to decode H.265 to H.264 or other SD formats. Meanwhile, you may want to encode regular videos to H.265 to get much better video quality. In such cases, a HEVC video converter can solve both problems and help you to do the jobs. Just read on to discover the best HEVC converter that you can use for free. If you are looking for a free, reliable and powerful HEVC video converter tool, then you should take Gihosoft Free Video Converter into account. It has proved to the fastest and easy-to-use free HEVC converter relied upon by million of users. This tool is fully supports the H.265 format, so that you can easily convert almost all video formats to or from H.265 video files with fast speed as well high quality. Besides, this program provides easy video editing features, including trim, crop, special effects, watermark and subtitles etc. It allows users to directly transfer the converted H.265 videos to devices like iPhone, iPad, and Android phones. 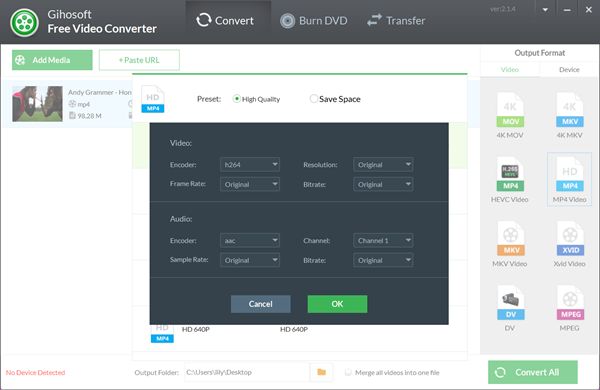 Just download Gihosoft Free H265 Converter and install it on your PC or Mac, then follow the step-by-step guide to convert any video to H.265 at lightning speed. Please note the steps to convert H.265 to H.264 or other SD formats is almost the same. Run this free HEVC Video Converter on your computer. From the primary window, click the “Add Media” button to import the video files you want to convert to the HEVC encoder. Remember that you can upload as many files as you like because this tool supports batch conversion. From the preset options on the right side panel of the program, click the format of your choice and select it, such as MP4, MOV or MKV etc. Then select “H.265” as video Encoder by going to the Settings option. Also, you can customize video resolution, frame rate, bitrate, as well as audio encoder, channel, sample rate, bitrate, etc. Once everything is set, just locate and click the “Convert” or “Convert All” button to initiate the conversion process. The completion time would depend on the size of your video files. When the conversion is done, a “Finished 100%” notification will appear on the progress toolbar. 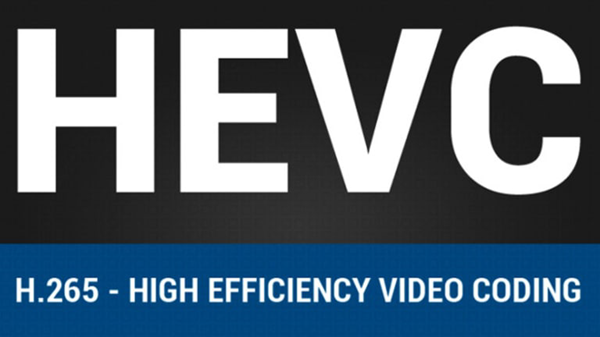 High Efficiency Video Coding (HEVC) or H.265 looks set to become the next big thing in videos. That said, to maximize access to this high quality video format on your device, a HEVC video converter will come in handy. Don’t be at a disadvantage, use the information above to convert video from or to h.265 formats irrespective of the video size and format- that’s where a free h.265 video converter like Gihosoft Free Video Converter have got you covered.